If you expected to hear something smart about ideas for today’s theme you are at loss here. It is WAITING, plain and simple waiting that can be interpreted in a number of ways. I found this graffiti practically at my doorstep and could not help posting it. Make a photo post post on today’s theme, before next Thursday. What an elegant wall! Sometimes, the art we see in graffiti would look good hung on my living room wall! Beautiful. Yes, I believe it would, Marilyn 🙂 Thanks so much. Oh I love that piece of street art. Lovely little details in the building and train, and what is the man thinking? He doesn’t look cheerful. Now I’m waiting for a bit of inspiration for a post to respond to your theme! By the looks of it you did not have to wait long 😀 The man is tired of waiting… the life has taken over…. Thank you, Debbie. Great mural. Great photo. Who wants smart when they can have this!! 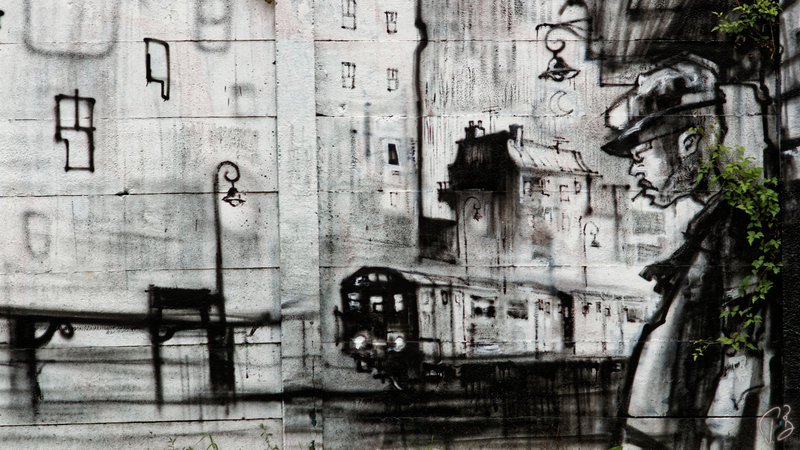 The artist’s talent shines through in this graffito…smART. What?! No comment on the music? Yes, it is. I like Moby. Thank you for the research. Sono contenta che ti piacce, Anna. Oh, so well caught, Paula. Cheers, Tish 🙂 I am so very glad that you like it. Thank you very much. I will have to come to your place later when I have access to videos. Hi Paula, I really like your picture – especially the way you integrated the green on the right side. This detail tells a lot of the story (in my eyes). Brilliant! It is the mural artist that integrated it; I just snapped. And yes, I agree with you – find it genius – that made me snap. …and since reading this post I had this idea. Now I finally gout around to doing somthing with it. That’s very 3 dimensional. Great artwork to have nearby, Paula. So true 🙂 Happy to have you here, Draco! Ravishing bit of graffiti, Paula. 🙂 🙂 Sending hugs! Thank you, Jo. I am so happy you could join. Maybe I’ll make it to yours tomorrow. That’s true street art, Paula!!! A very powerful piece indeed. Tu tambien Eleazar y muchas gracias. Afternoon, Miss Paula! How the heck are you this glorious Thursday? Here we go … hope they bring a smile or two. I like the graffiti Paula. Simple black and grey work and it’s cool how the vegetation is adding color and texture to the graffiti. Your stuff is really poetic this time. I really love it, Max. Tussen tak. Brilliant bit of street art! Moving piece of work, both the graffiti and the photo. What a fascinating photo, Paula – for a moment, I thought the train was real. Thanks for hosting your always-interesting challenges. Best, Babsje. here I come a few minutes before deadline :-). Sadly, it’s gone. I took it a couple of years ago. This shot is so good!